It is ironic that Jesus’ opening imperative in His “Olivet Discourse” is “Take heed that no man deceive you.”1 This is His command, but it begs a question of means: “How do we avoid that?” There seems to be more conjectures and misunderstandings over this passage than almost any other in the New Testament. The tools to avoid deception derive from a study of epistemology: the study of knowledge — its scope and limits. Our exploration of this passage will challenge more than simply our hermeneutics alone. It will challenge our grasp of the whole eschatological plan in its entirety. For many students of eschatology — the study of last things — the so-called Olivet Discourse has proven to be a troublesome passage, with many finding it confusing and ostensibly self-contradictory; a hermeneutical battleground between the dispensationalists and the preterists, etc. The preterists insist that this passage — and the Book of Revelation — has been already fulfilled, and much of it is dismissed by them as simply allegorical. 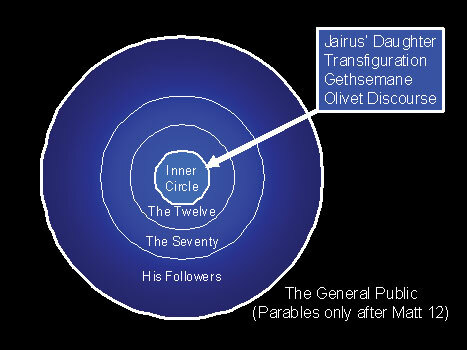 Yet even those who embrace a dispensational view have difficulty reconciling many of the Olivet Discourse passages. In optics, the resolving power of a telescope determines its ability to distinguish between two close, but distinct, stars. An apparent single star viewed with a cheap telescope turns out to be a pair of distinctly separate stars when viewed with a telescope of better optical quality. This quality is known as the “resolving power” of its optics. We seem to have an analogous situation here. In this case, we may benefit by setting aside our presumptions and presuppositions and let the several texts speak for themselves. The traditional “harmonization of the Gospels” is part of the problem. Ever since Augustine, scholars have attempted to meld the four distinct Gospels into a combined narrative. While this can be useful for a cursory review of the life of Christ, it can also result in a myopia of sorts and the Olivet Discourse (recorded in Matthew 24, Mark 13, and Luke 21) is a salient example. Since Matthew was skilled in shorthand, we tend to lean on his detailed rendering. And yet there seems to be a substantial disparity between his record and that of Luke’s. Numerous elements appear identical in both accounts, so it has been fashionable — for 1700 years — to assume that they both deal with the same event. Attempts to “harmonize” them have continued to yield a treacherous minefield of confusion. It seems that setting aside all of our presuppositions, and simply trusting the integrity of the texts may improve our “resolving power” in addressing these passages. Jesus called us to respect the details,2 so let’s take a closer look at each of them. They each may be focusing on different events from a different perspective and maybe even addressing different audiences on different occasions. The similarities of expression in the various accounts may have caused us to jump to premature conjectures, etc. For many shall come in my name, saying, I am Christ; and shall deceive many. And ye shall hear of wars and rumours of wars: see that ye be not troubled: for all these things must come to pass, but the end is not yet. For nation shall rise against nation, and kingdom against kingdom: and there shall be famines, and pestilences, and earthquakes, in divers places. All these are the beginning of sorrows [or “birth pangs”]. This proves to be a major verse for a number of reasons. Here Jesus saves us hours of boring library research by authenticating the authorship of Daniel, and his role as a prophet. Jesus also referred to a key historical event: the desecration of the Temple by Antiochus Epiphanes that had occurred two centuries earlier in 167 B.C. Luke then focuses on a desolation of Jerusalem that precedes the series of signs that earmark both passages! Matthew focuses on a desolation that follows that same series of signs. 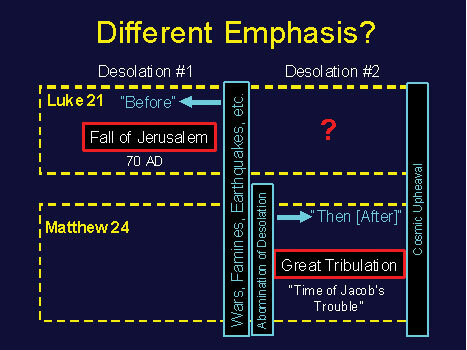 Luke’s rendering deals with the fall of Jerusalem that occurred 38 years later in 70 A.D. Matthew all but ignores it. 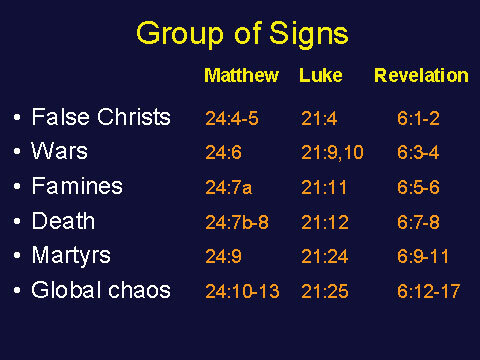 In contrast, Matthew’s account deals with events that follow that same series of signs, including the Abomination of Desolation announced in Matthew 24:15. And when ye shall see Jerusalem compassed with armies, then know that the desolation thereof is nigh. Then let them which are in Judea flee to the mountains; and let them which are in the midst of it depart out; and let not them that are in the countries enter thereinto. Over 1,100,000 perished in the siege. Those who heeded Jesus’ warning apparently escaped. Some scholars infer that few, if any, Christians perished in the siege. 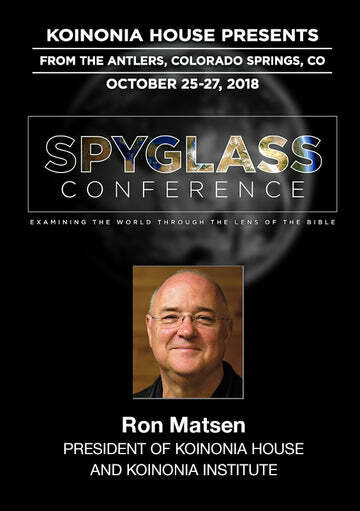 By contrast, Matthew’s account conspicuously terminates with the Second Coming of Christ and the cosmic upheavals incident thereto, which are alluded to in both accounts. When we were in school, learning to diagram sentences was useful in understanding grammar: subject, predicate, adverbial phrases, etc. Here, too, a composite diagram may prove helpful (see graphic). Matthew’s account, written for the Jews, seems destined to be a survival handbook for those enduring the forthcoming unprecedented time. There are numerous complex issues that still emerge from these several accounts. It isn’t clear that they even occurred at the same time or place. And in the day time he was teaching in the Temple; and at night he went out, and abode in the mount that is called the Mount of Olives. And all the people came early in the morning to him in the Temple, for to hear him. Clearly, a side-by-side verse-by-verse study of these passages is essential. To facilitate a more detailed review of these much debated issues, see our briefing package: This Generation: Resolving The Olivet Discourse. Daniel 8:13; 9:27; 11:31; 12:11. Daniel 12:1. Cf. Daniel 9:27. Ibid. , Book 7, I 1ff. Josephus Flavius, The Wars of the Jews , Book 2, XXII 2ff. Ibid. Book 4, X 7ff.